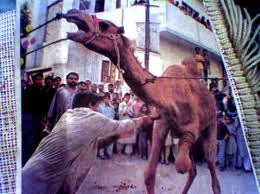 Billions of animals will be sacrificed by Hindus and Muslims this month in India. On the eighth and ninth day of the on going Durga Puja ( Durga Puja is a 10 day worship festival of Goddess Durga ); millions of animals will be sacrificed to the Goddess by Hindus! Similarly, Muslims will sacrifice millions of animals on the occasion of Bakrid this month. People sacrifice animals to their Gods and Goddesses hoping this will bring peace, prosperity and happiness to their lives! How can cold - blooded killing and shedding innocent blood bring peace and prosperity to one's life is beyond one's comprehension! Can we really be happy and get prosperous by taking a life away? Every religion is great and gives a message of love, peace, harmony, friendship and brotherhood. All the killings and mass murder of sweet, harmless, beautiful and innocent animals is just man-made. Human kind, which is not kind at all, would destroy everything beautiful created by the Lord. Animals don't destroy anything on Earth. They take only what Mother Earth has to offer to them. In fact, animals make an invaluable contribution to maintain the sanctity of the eco-system which is vital for our survival. We must understand that if animals won't be left on the planet, we would perish too. Therefore, we must not kill animals who have done us no harm. We must not murder them for our beliefs and for merely a tasty dish.